Thank you so much Tulsa's Best Auto! The staff is awesome and they got me approved for a down payment I could afford and a monthly payment that is definitely able to fit into my budget. They also give me the peace of mind of buying a used vehicle with their powertrain warranty. 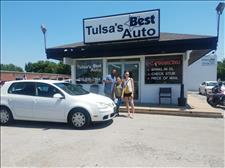 I am very thankful to the staff at Tulsa's Best Auto for their care with my time and effort in mind. I highly recommend them to anyone that think they may not be able to get financed on a vehicle based on their credit. 5 out of 5 will buy here again. Jarad was awesome help! Found what we wanted same day I cam in! Thanks so much! Jarad was AMAZING!!! Everything he said could be done, was done. 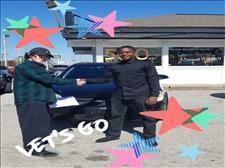 The same day I came in I was able to drive off the lot after days of exchanging information for improvement! Lorenzo Spencer was very cooperative and helpful. He took plenty of time to help me decide what I wanted and he even guided me through the process of getting insurance. I highly recommend Tulsa's Best Auto to anyone needing a vehicle. I'm was pleased with the service at Tulsa's Best Auto. They have quaility used vehicle and they will bend over backwards to make a good deal with you! At Tulsa's Best Auto we are proud of the quality used cars we sell and our dedication to serve the needs of our customers. This is reflected in the amount of repeat business we receive. Whether this is your first purchase with us or one of many that you’ve had, you can count on our dedicated sales staff to make it the best buying experience possible.